To try and garden by the book really would get us confused this year, at the time of writing this we are in the middle of a very warm period. Last year at this time we suffered from the beast from the east and the start of a very late spring because of all the rain. This all makes it hard to write gardening notes at the correct time People often quote the internet as an authority but all I can say is your own experiences count for so much. 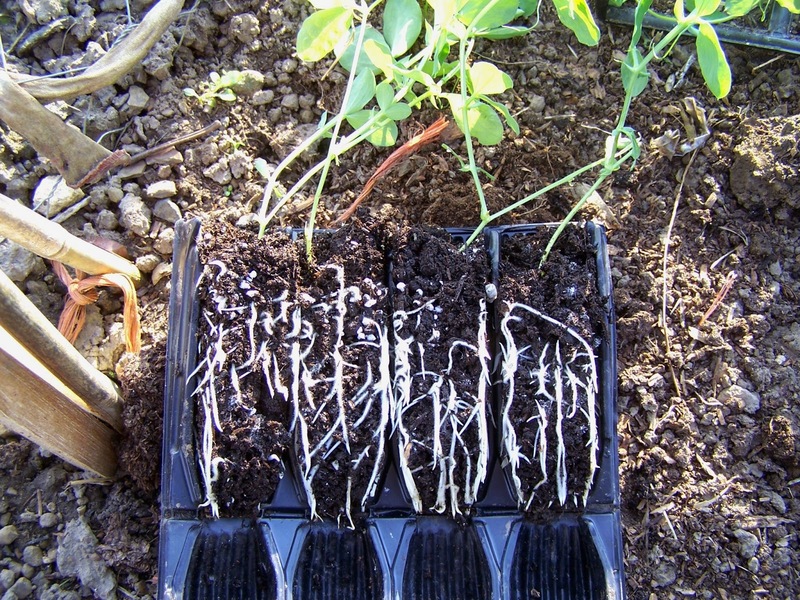 Sowing of many vegetable seeds can carry on this month, if you sow little but often you avoid a glut of one thing but have crops to harvest over a longer period. Many still use slug pellets, it is not up to me to say good or bad but by all reports we will lose them next year so this will stop all queries . 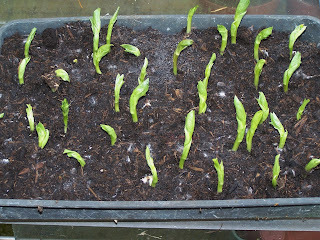 I would leave runner beans until the latter end of the month so as to avoid any late frost. Again with these I like to sow a few at a time so that so that you can pick from late July until Sept/Oct. My first head gardener always said the time to hoe is when you have no weeds then you kill them as they germinate. Many annual flowers can now be sown in pots or modules so that you have good plants for planting later, you will possibly need a greenhouse or propagator for this but many do not like too much heat. 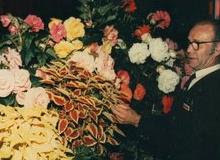 Cuttings can be taken from dahlias, begonias etc. if you want to increase your stock. 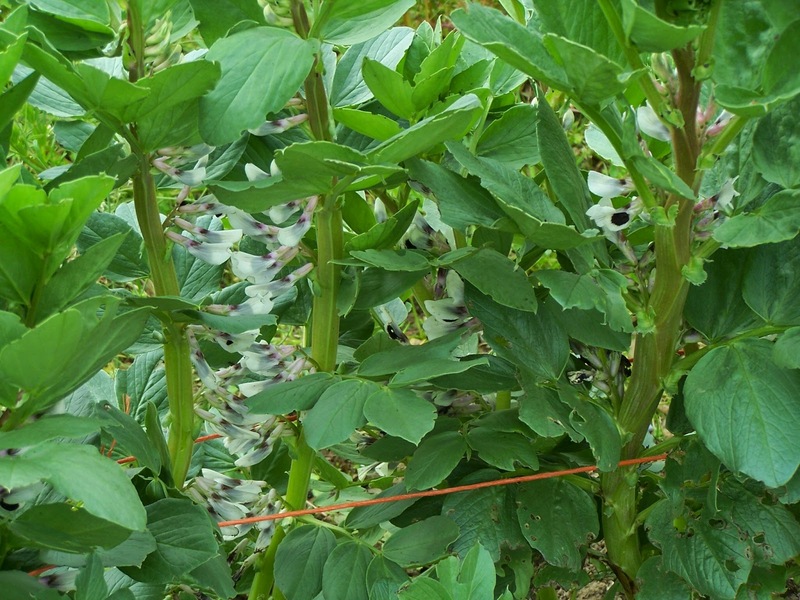 You can plant dahlia tubers so that they are through the ground as the frosts come to an end. Some of your hardy flowers like delphiniums can be divided once the new growth can be clearly seen. If hardy fuchsias were not cut down to ground level last month, you still have time. 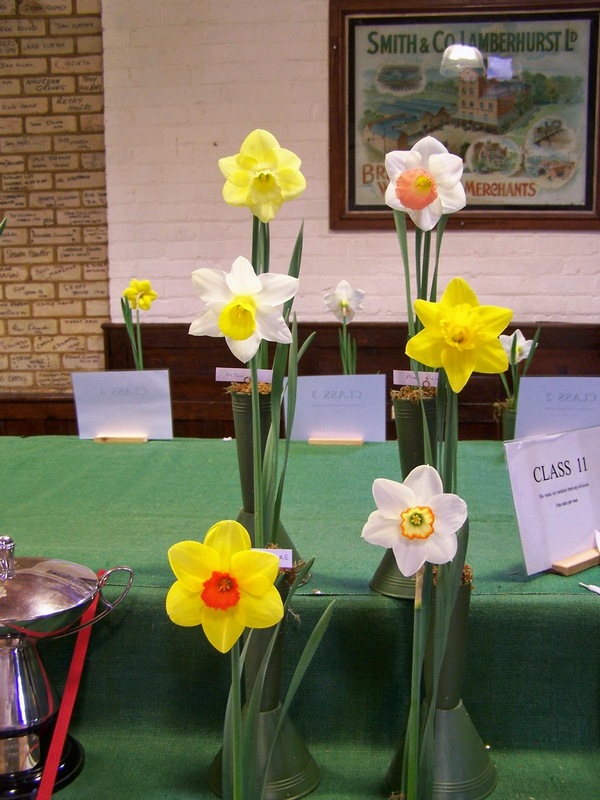 Some of your early daffodils will now be fading but please do not tie the foliage up in knots, it is there to absorb sunlight to help build up next years bulbs. 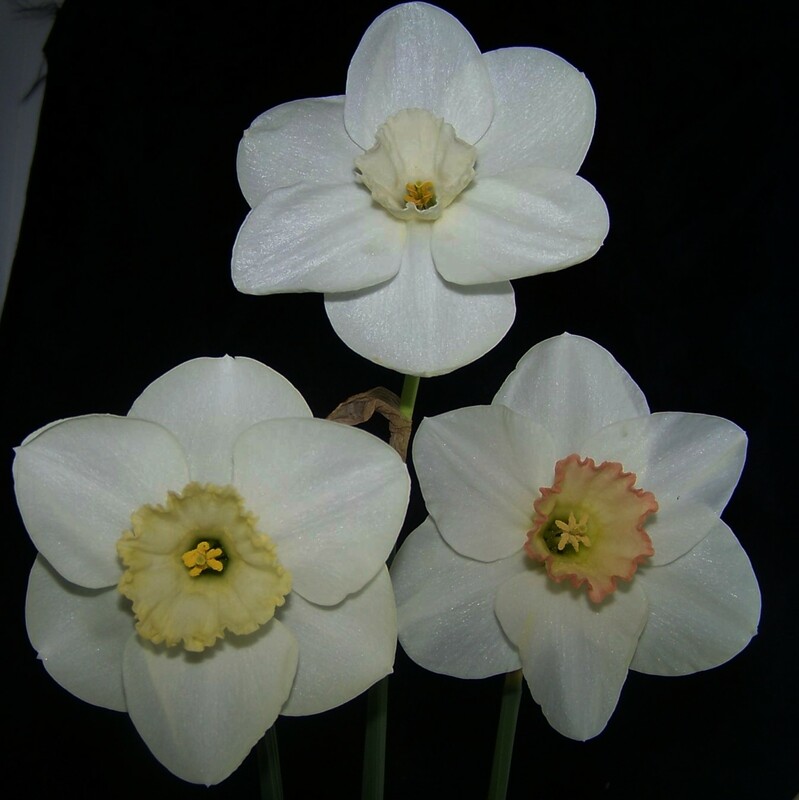 The RHS have done many tests and say that if the foliage is left for 6 weeks after the flower dies the bulb s do not suffer but if you leave them longer it is better. Removing the dead flowers before seed starts to set does help with the production of new bulbs. Once mowing is under way a feed of Lawn fertiliser will give good colour and help the grass compete with moss and weed seed. If you do not mow too low you can avoid moss getting a start. If you are going to attack any moss you should kill it first with a moss killer because if you rake it whilst it is alive you spread it even further. 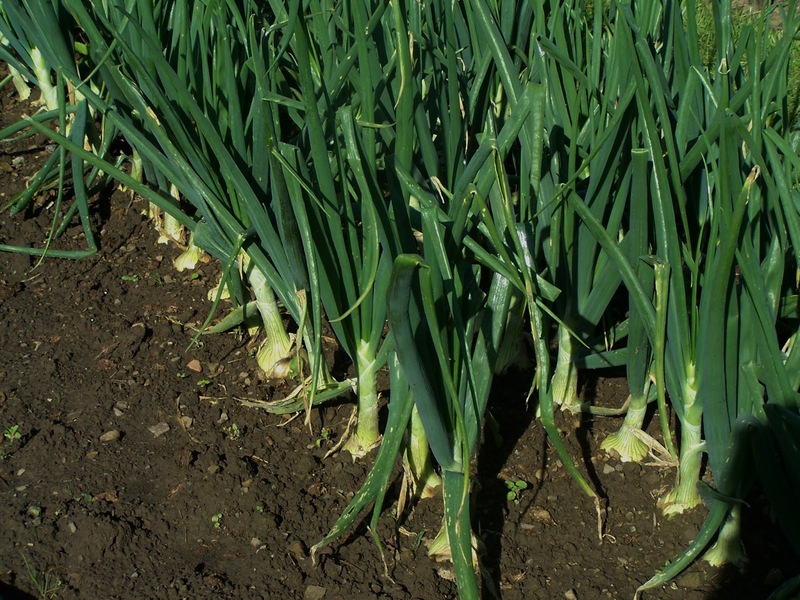 These onion sets were planted on Feb.14th ,the soil was treated with garlic powder against onon white rot when the crop was lifted. The photo was taken on April 2nd , when I plant sets I alaways just bury them having cut all the old foliage off to stop the birds pullig the stes up. As far as I can see all te sets are growig well. 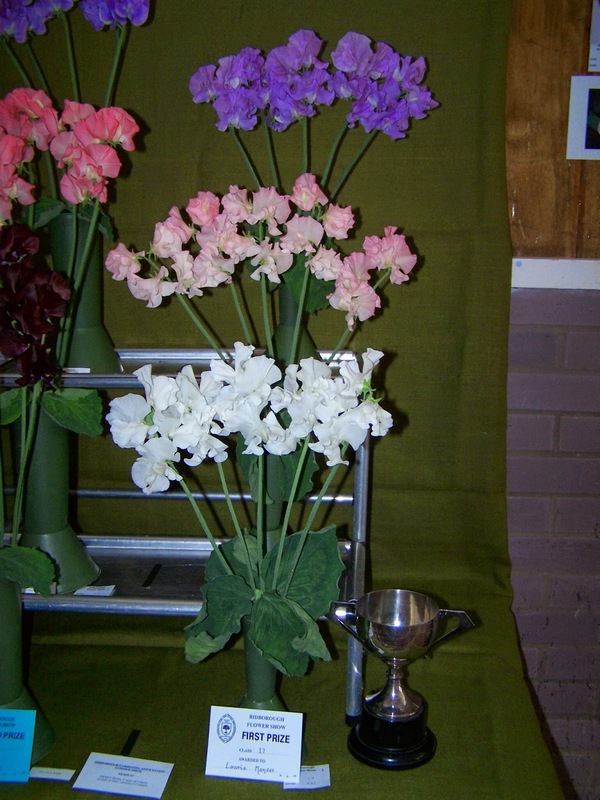 Planted sweet peas most are in root trainers but a few are in ordunary pots. 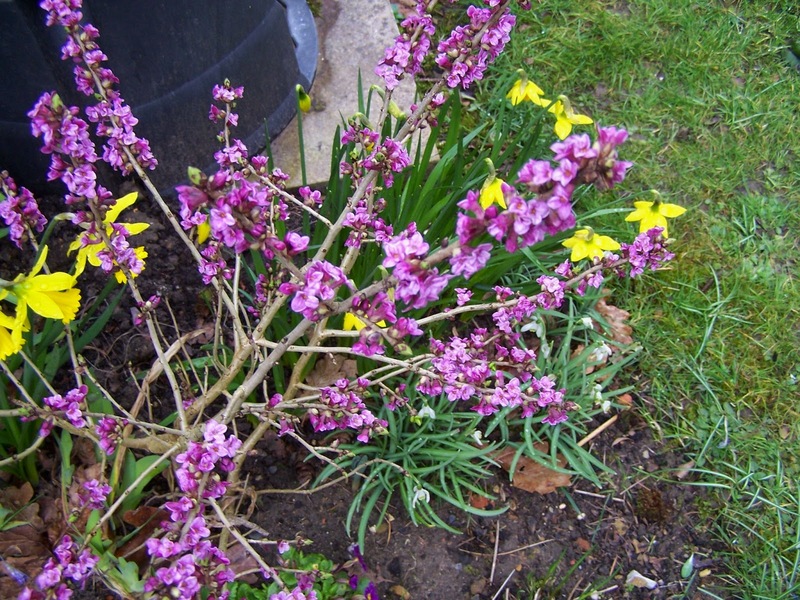 Daohne Mezereum raised from seed. 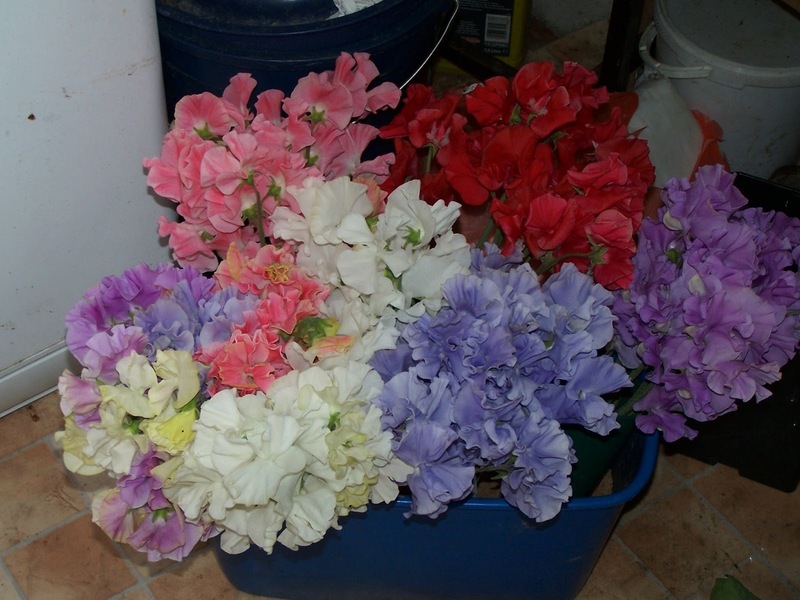 Sweet pea plants ready to plant but have to wait for a decent bit of weather to be forecast. The break is natural as I grow them outside all the winter to make sure they are hardy. As most of you will know I lost my garden when we had to move from the tied house with our employer dieing and me coming to the age of 80. Since then we have grow most things in containers apart from things I grow on my allottment. 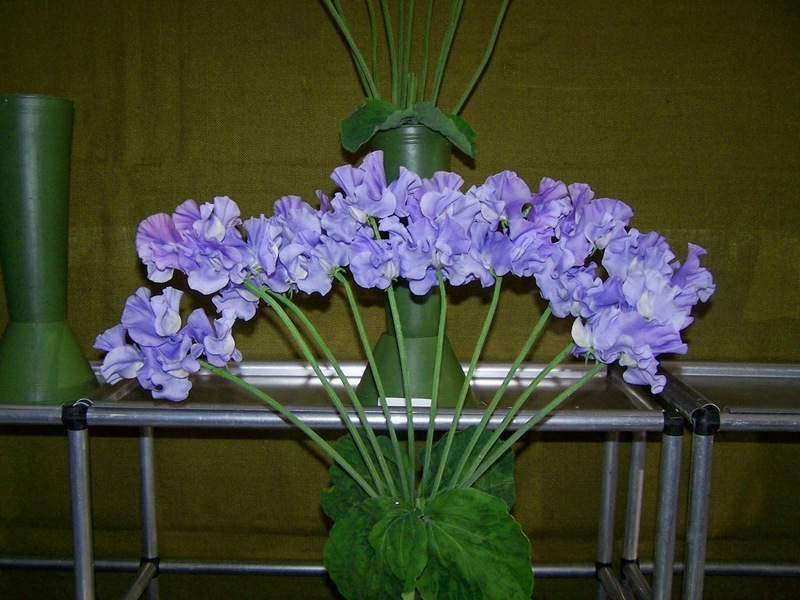 These picture are just to show some of the container plants. 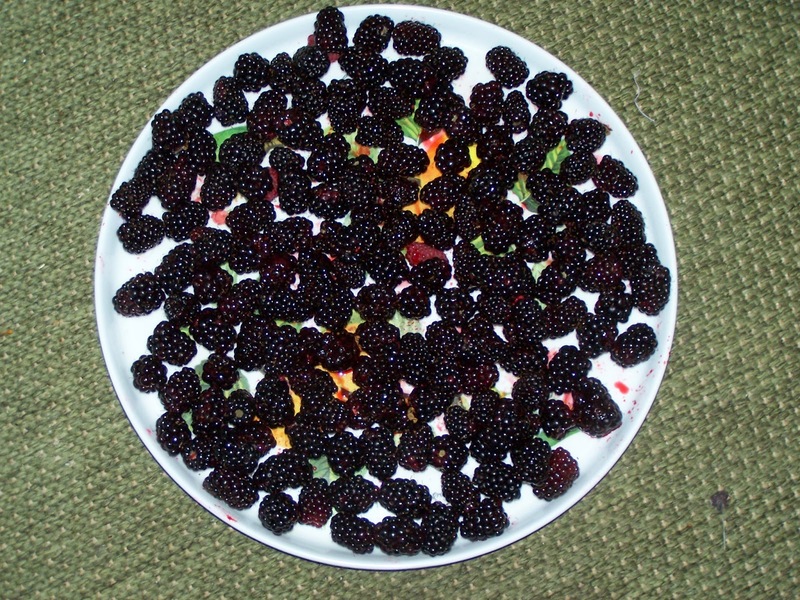 Thse are my first bunch picked 25th May which is right as I usually pick chelsea week. 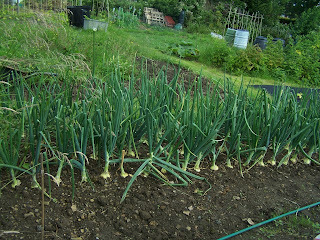 I went to my allotment this morning to check after hard frost. 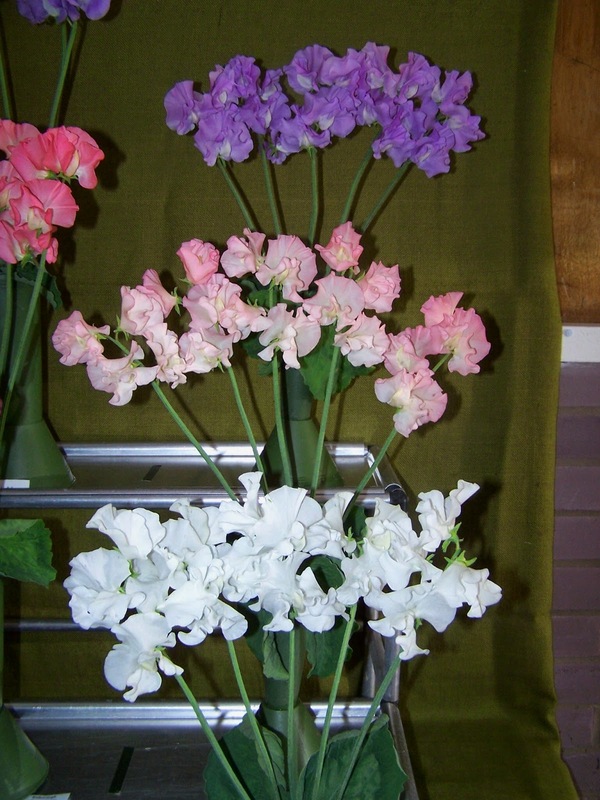 pleased to see sweet peas still looking good. They were sown on 8th October last year. 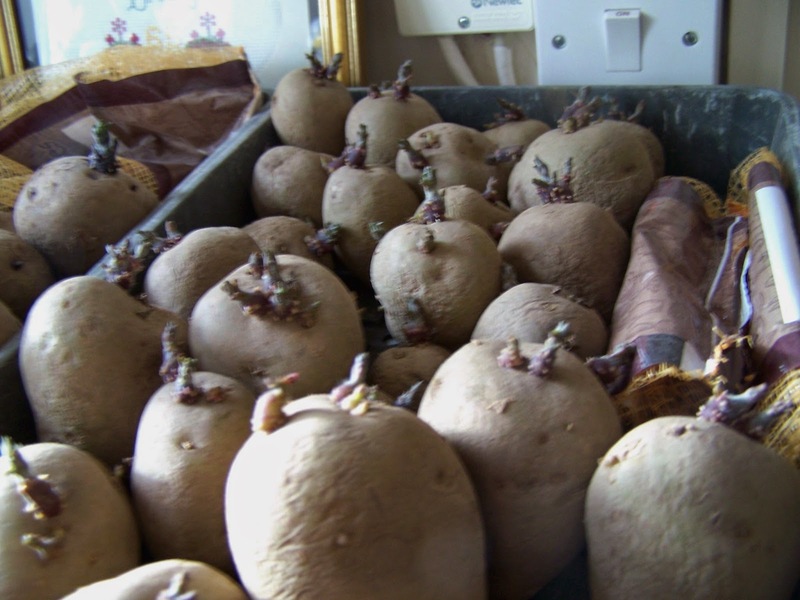 Potatoes ready for planting after at least ten weeks chitting, I will plant them on the flat so that I have plenty of soil for earthing up and the potatoes grow through the centre of the ridge rater than come out of the side. 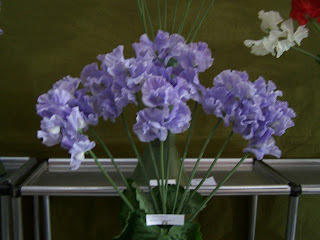 I sowed my sweetpeas on October 8th as I have done for many years, I have good germination 48 seedlings out of 50 seeds. I think there might be one or two to come up yet. 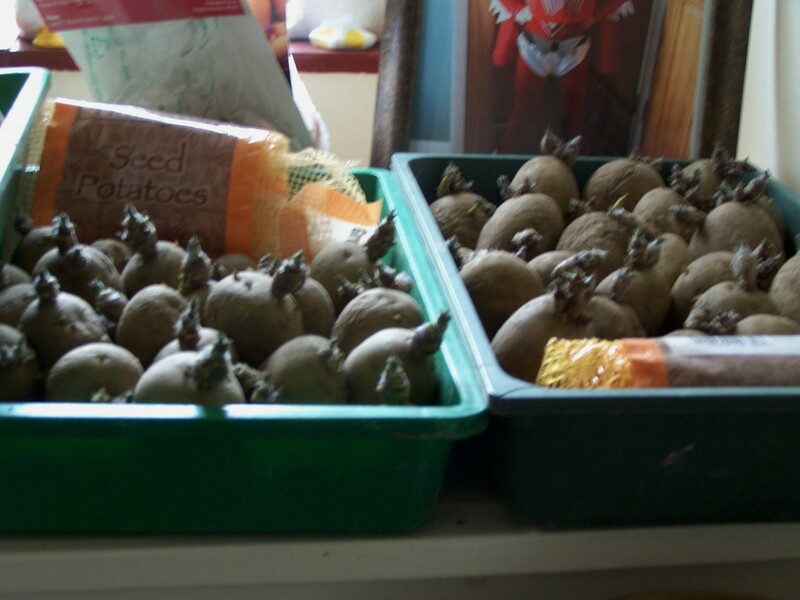 They are looking rather drawn as with no garden or greenhouse I am very limited as to where to put them. I must single them out within a few days. I have just singled the sweet peas into root trainers, there are 51 from 50 purchased seeds. They always allow one or two extras. 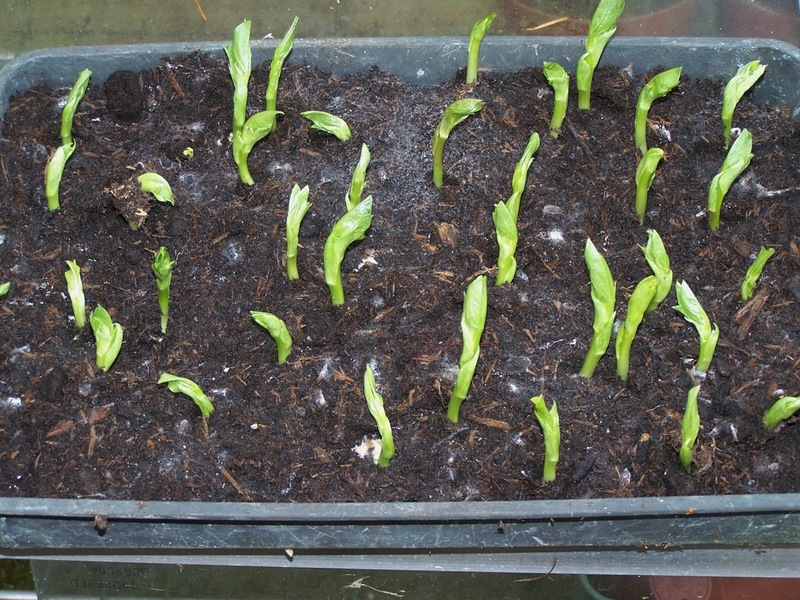 My latest picture taken on March 28th shows plants now, planted hoping weather stays good. waiting to be planted once the ground is suitable. 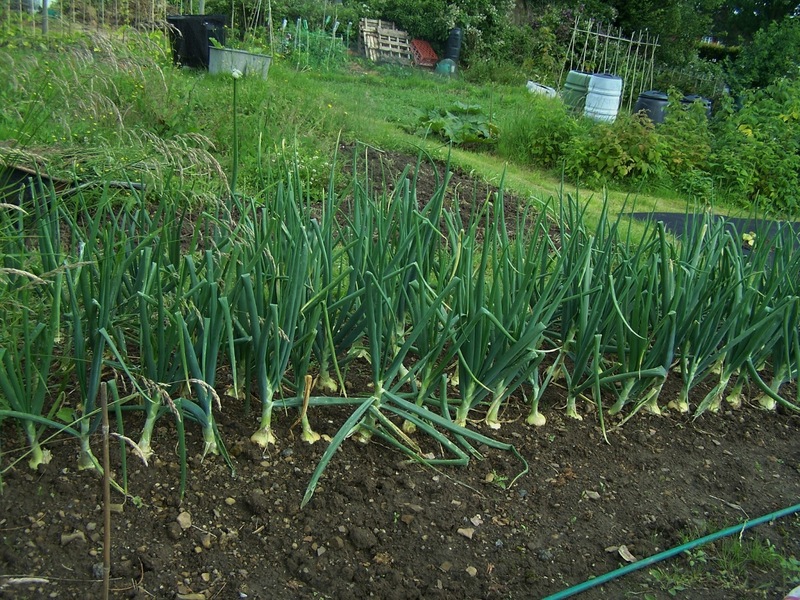 Onion sets just starting to show, I plant well down in the soil so that no trouble with birds, having got rid of white rot I get a good crop. 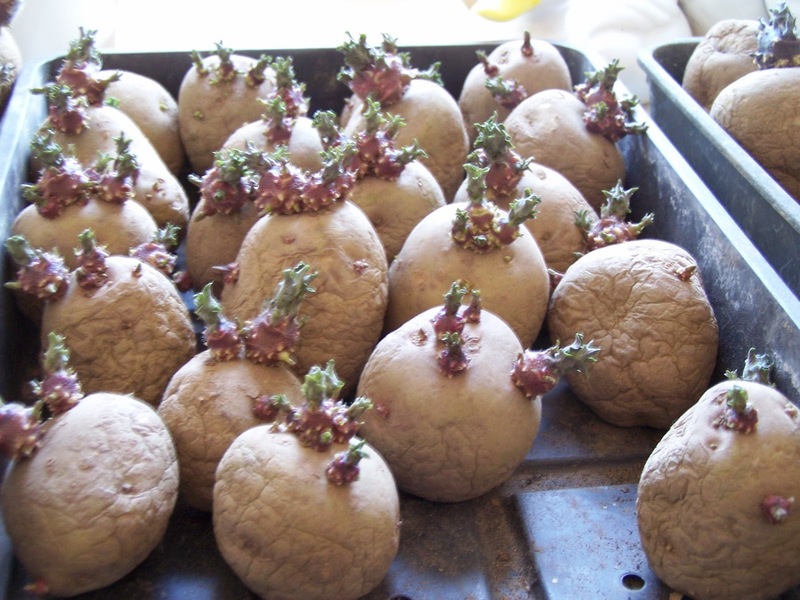 I am putting these pictures onto my website to show the effect of using garlic powder for white rot. 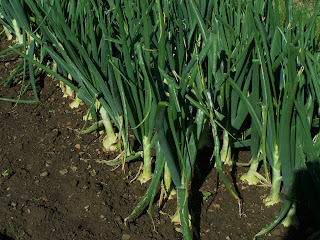 When I first took over this plot I suffered a complete loss of my onion crop due to white rot, I have treated this area with garlic powder and this year they really do look good. I just need some sun to help ripen them up. It has been a bad year for me with sweet peas, I decided to try saving my own seed last year and this has been very reasonable but when I planted the plants back in March , the very next day we had storm Katie. 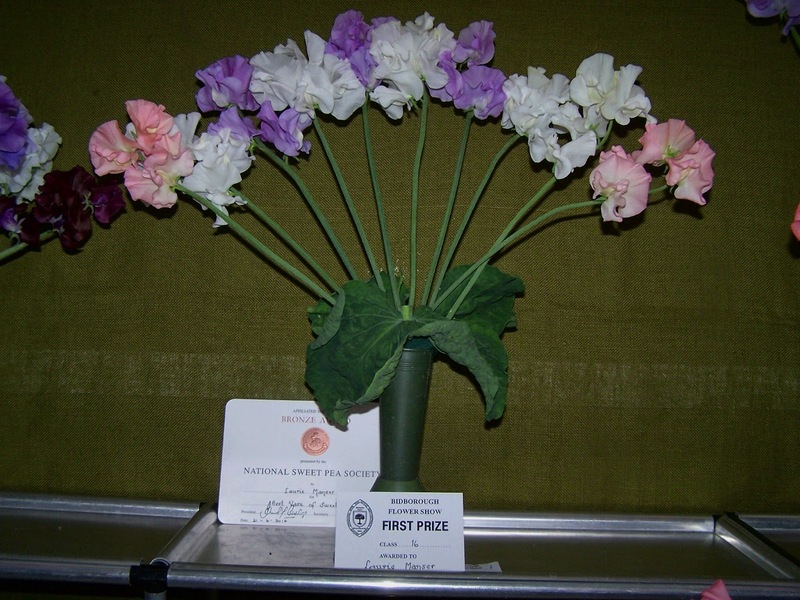 This almost blew them out of the ground but enough survived to amke best part of a row. As they came into flower I had bud drop plus a spell in hospital, this meant I had to let the plants go for about a week meaning bent stems. 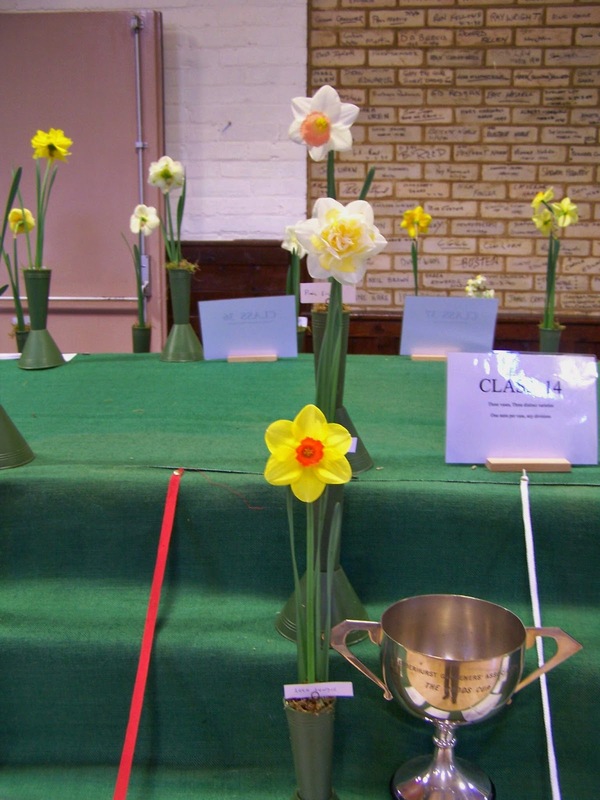 However when show day came I managed one vase of ten, these were good enough to bet best in show so I still hold the cup which I forst won 42 years ago. I have not had it every year but will keep trying. 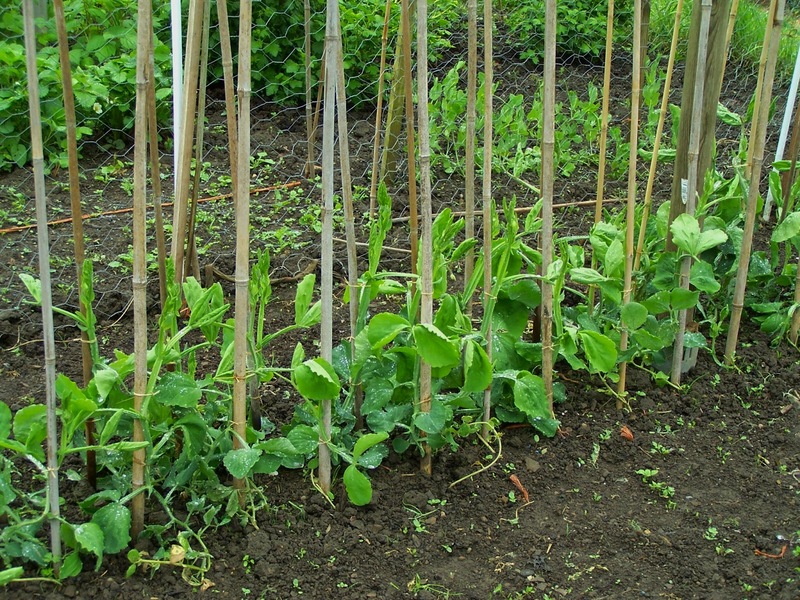 In past years I have sown my Aquadulce broad beans direct in the round in Oct/Nov but this year as the ground was very wet and in the past I have lost some to the mice etc. I have tried starting them in a tray. I have no greenhouse now so they have been in a cold frame. They are now ready for planting out and look quite good. 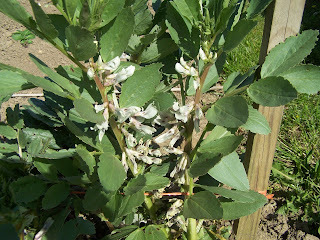 Broad Beans now in flower , they came through the winter very well. 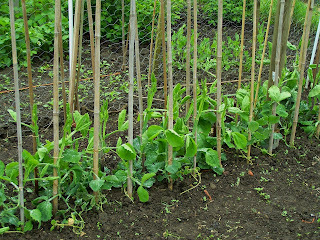 Some of my Aqaudulce broadbeans , I sow in late October as they are a good hardy variety to stand the winter. 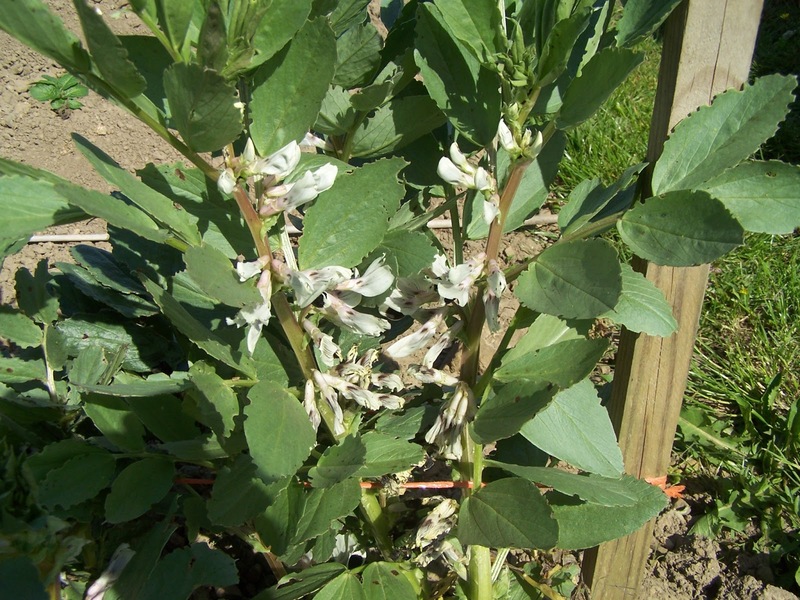 Sometimes they get damaged with servere frost but even then they will break at soil level. Had some sucess at our show Saturday April 11th. 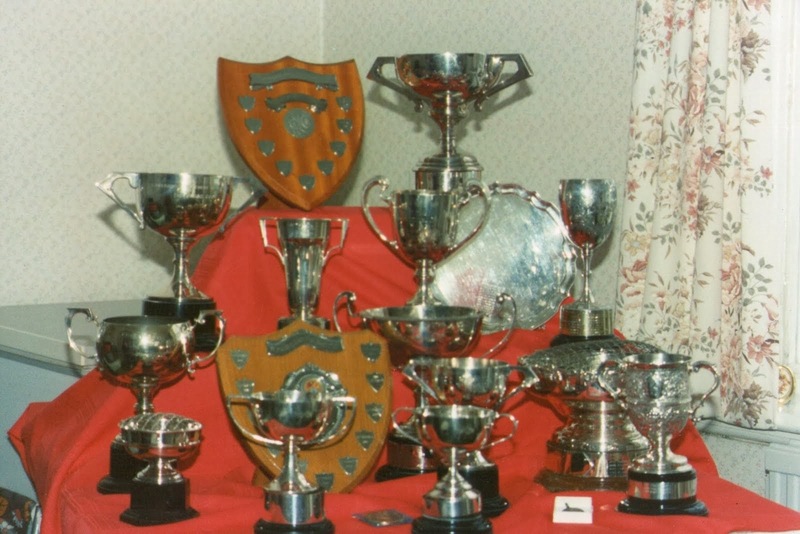 Many varieties were not out but using those that were I won 4 trophies along with 10 first prizes. I am very pleased as they are all grown on my allottment now having lost our agrden when we moved from the tied house. 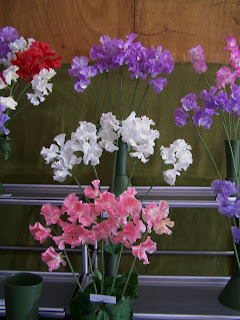 The pink trumpet is called Pink Silk. There seems to be a lot of chat about if we should chit seed potatoes ready to plant or not. I always say there are many different ways of doing things in gardening, but just looking at the alterantives. 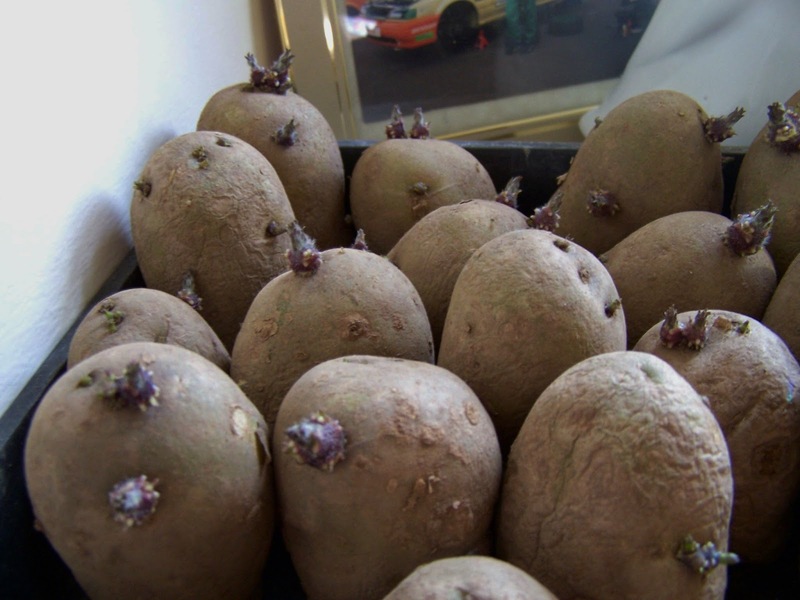 If you do not chit you have to leave the poatoes in the bag which will give you long weak shoots whereas the shoots are much better if laid out, so I chit as in the photos. I bought these just before Christmas and they will not be planted for some long time yet. The larger ones will be cut when I plant them. 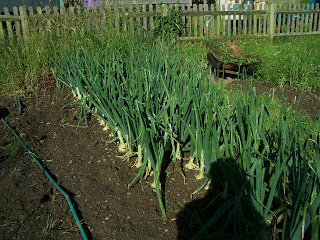 I have mentioned before about having white rot in my onions and treating the soil with garlic powder. I still had white rot badly this year (2014) but reading that others seemed to have more success I thought I would try once more. I am not sure where I got the garlic powder last year but when I got some more this year as used for horses it smelt a lot stronger than last years, so I have once more treaeted the soil and will see what happens next year. 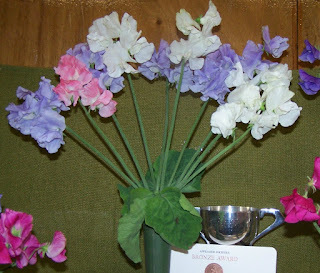 A fortnight ago I had some success with my sweet peas that I now grow on the allotment, four first prizes with one cup, one medal and a certificate. 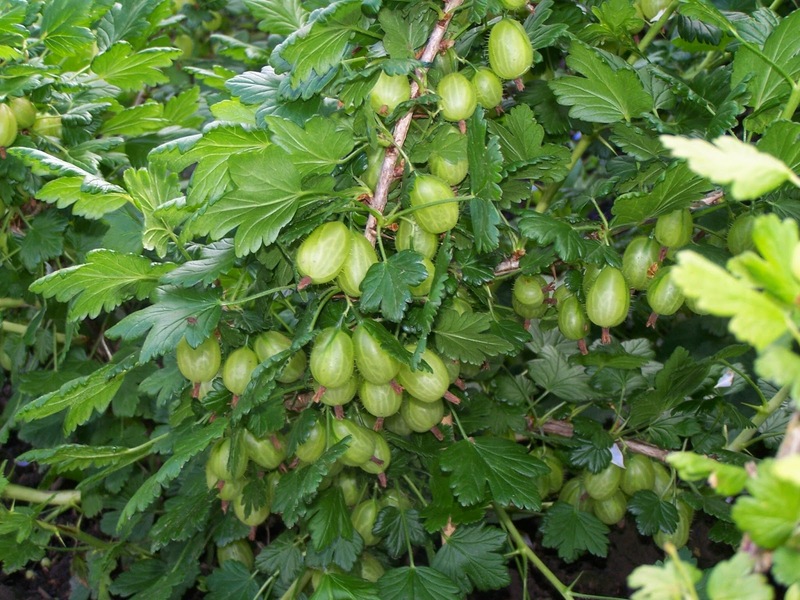 Had to thin some of my gooseberries this morning, this is their first year but the branches were touching the ground. I did buy from a fruit nursery so that they were lifted one day and I planted them with a little "root grow" the next day. 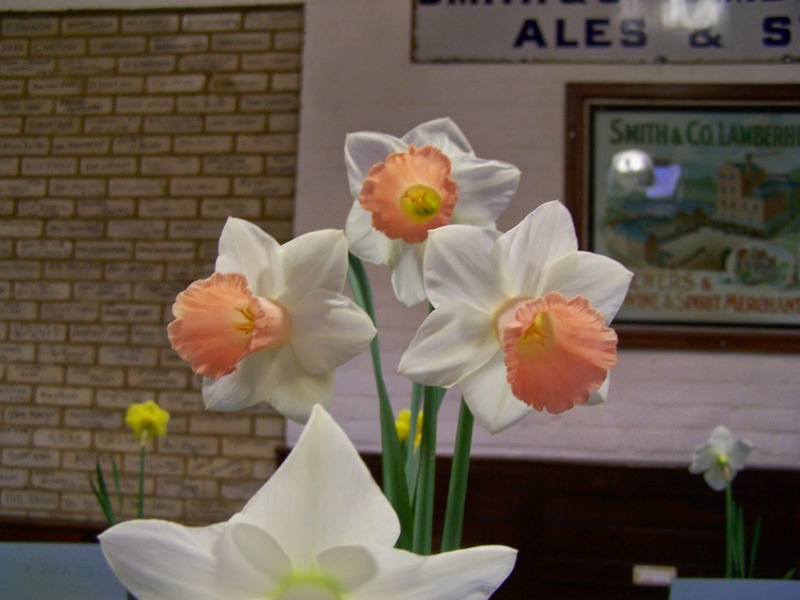 Memories of a Garden Boy"
I gave my talk "Memories" at Ruxley Manor Garden Centre today. (24th Feb.2015) .There was a really good attendance with several remembering my vegetable talk form last year.We spotted some posters about the talk so Ann took a photo so that I can use it. We did 2 talks last week and have another on Thursday this week. My talks have now come to an end ,I had a good run with the first one being in 1964 but night driving is now not good. I will still do a few daytime ones but un-illustrated. Welcome to Laurie's Garden hints. I am a professional gardener with some 60 years experience. If you have any queries and I can help I will be pleased to do so. 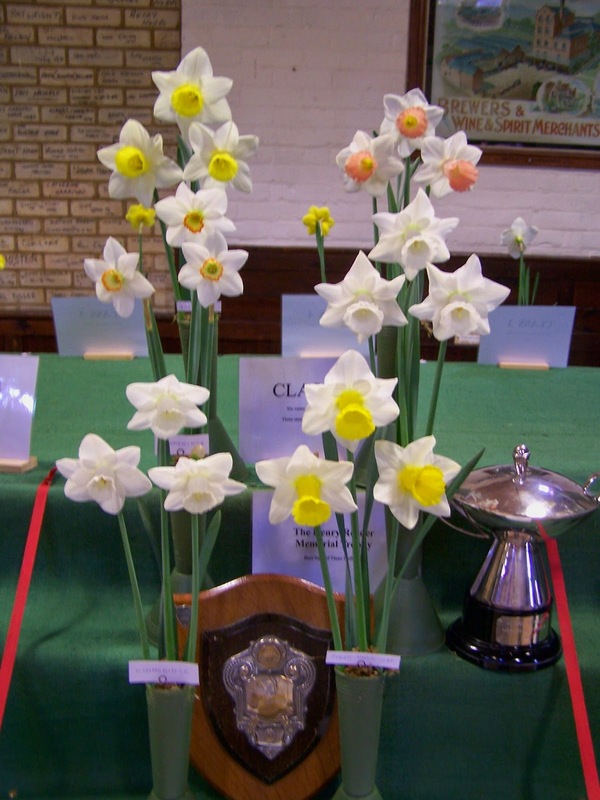 I have now retired from being chairman of the Lamberhurst Gardeners' Association after 25 years , Ann my wife who has been Secretary for 24 years has retird from her post as well. My email address is laurie.manser@virgin.net or you can leave a comment on an exsiting subject. I have given talks to almost 600 different groups over the past years and always say "this is my way, it may not be the book way but it works for me"
I still give talks to all sorts of groups, I do one "Memories of a Garden Boy" which is about how I was trained as a garden-boy back in 1948. This talk is very popular with retirement groups etc. If you would like a full list of my talks just email me at the above address and I will email a copy to you. Many people have been asking if my book is still available,I do not get it printed now but if you want to read it, you can click on here and download it. If you would like to donate a small amount please use donate button, the money will go to the BHF as I had heart surgery 17 years ago without which I would not have enjoyed the last 17 years. Many people have been asking if my book is still available, so here is a link to click and download it.